What Is a Heat Pump's Effective Temperature Range? | Maritime Geothermal Ltd.
Air source heat pumps have long had a reputation for being an excellent alternative to expensive heating options like oil or electric baseboards, but many brands fall short when it comes to performing well in colder temperatures. That has changed with the introduction of cold weather heat pumps, which are heat pumps that are specifically designed for cold weather, like our air to water heat pump. But what makes a heat pump suitable for cold weather? And what does that term mean anyway? Unfortunately, while many heat pumps are advertised as cold climate heat pumps, few are equipped with features to make them perform better than conventional heat pumps when the temperatures drop, and few manufacturers list the heat pump’s effective temperature range. We’re going to change that today by walking you through the unique features that make our air source heat pumps perform better in cold weather, and show you the actual efficiencies our heat pumps achieve at different outdoor temperatures. When it comes to the overall layout of the machine, we drew on our experience and knowledge in the geothermal heat pump field to inform the design of the air source heat pumps. Geothermal heat pumps are the ultimate cold weather heat pumps (which we’ll explain further below), partially because the heat pump is located inside the home in a dry, conditioned space. Putting the heat pump indoors reduces the wear and tear on the main components of the heat pump and boosts the longevity of the machine. When a heat pump is operating in heating mode, frost accumulates on the outdoor heat exchanger. This is a naturally occurring phenomenon, but the frost acts as an insulator and reduces the heat pump’s efficiency by reducing the heat transfer from the outdoor air to the coil. To eliminate the frost, the heat pump will go through a defrost cycle where it switches into cooling mode. In cooling mode, it is moving heat from the home into the outdoor air. The heat pump melts the frost, switches back into heating mode and continues heating the home. Most air source heat pumps will defrost on a timer, which can lead to partial defrosts (where part of the coil doesn’t fully defrost) or too many unnecessary defrosts, which is inefficient. All Nordic air source heat pumps are equipped with intelligent defrost logic. Intelligent defrost logic is a program run by the heat pump’s control board that uses several inputs to determine exactly when the heat pump needs to run a defrost cycle on the outside air coil. Because the intelligent defrost logic ensures the heat pump only defrosts when necessary, this program automatically maximizes the heat pump’s efficiency and minimizes operating costs. One issue frequently mentioned by homeowners with heat pumps that aren’t designed for cold weather is that snow will often clog up the outdoor unit, preventing it from operating. With a Nordic air source heat pump, when the outdoor temperature drops to the point where snow is possible, an outdoor temperature sensor sends a signal to the control board to turn the outdoor fan on at a low speed, even if the heat pump isn’t running. This low-speed fan operation keeps snow from building up inside the unit. The outdoor portion of the heat pump has two other features that make it uniquely designed for cold weather operation. First, there is no drain pan on the bottom of the heat pump, in fact, there is no bottom at all. This is so condensation doesn’t drip off the heat exchanger and freeze, possibly building up in the pan and/or breaking the coil. Instead, moisture will drip off directly onto the ground. The outdoor part of the heat pump also comes with an optional leg kit to lift it up and away from the snow so that it won’t get buried in a snow drift if mother nature decides to come calling. While our air source heat pumps will operate down to -4°F (-20°C), the colder the outdoor air, the harder the heat pump will have to work to produce heat for your home. 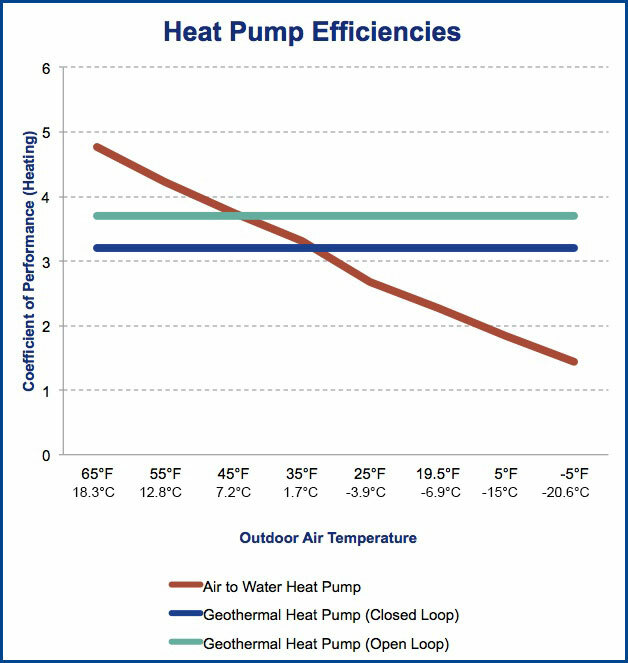 You can measure how well a heat pump produces heat using a formula called the coefficient of performance. The coefficient of performance essentially measures how much energy output is produced for a specific energy input and expresses it as a number. For example, if a heat pump requires 1 watt of energy in to produce 4 watts of energy out, it would have a COP or 4/1 or 4.0. The extra three watts of energy come from either the air (for air source heat pumps) or the earth (for geothermal heat pumps). You can find more detailed explanation of heat pump COP at the link. Geothermal heat pumps have a steady COP because their heat source (the ground) never fluctuates in temperature. The ground always maintains a constant temperature, no matter how cold or hot it is outside. This stable heat source makes geothermal heat pumps the ultimate cold weather heat pump, but air source heat pumps can still get the job done. Air source heat pumps have a fluctuating COP because their heat source (the air) fluctuates as the season changes. To help take some of the mystery out of these fluctuating COPs and give you a sense of the heat pump effective temperature range and efficiencies at freezing outdoor temperatures, we’ve mapped how our heat pumps perform at different temperatures. The data above was taken from an ATW-65 and the equivalent geothermal heat pump (W-65) on both an open and closed geothermal ground loop. As you can see, the warmer the outdoor air, the better the air source heat pump performs. As the outdoor air temperature drops, the heat pump needs to work harder, so it becomes less efficient. The COP continues to drop until we reach an outdoor temperature of -4°F (-20°C). -4°F is the lower limit of our air source heat pump effective temperature range. In temperatures lower than that the heat pump shuts down and electric backup heat takes over. The backup heat protects the compressor and preserves the longevity of the machine. The backup heat may also come on periodically in warmer temperatures if the heat pump alone cannot satisfy your home’s heat load. Electric backup heat has a COP of 1.0. You’ll also notice that the geothermal heat pump lines are higher and remain constant. That’s because the ground does not fluctuate in temperature the way the outdoor air does, so a geothermal heat pump will never lose efficiency (except in extreme cases), and never needs backup heat. Air source heat pumps can be optimized to perform cold weather heating, but geothermal heat pumps will always be the ultimate cold weather heat pump. Learn more about Nordic air source heat pumps by downloading our free Ebook: All About Air Source: How Innovative Air to Water Heat Pumps Differ From Geothermal. Find a Dealer for a customized quote! We are just having a new Nordic heat system installed in a new house at 26 Bowater Blvd. in Pasadena Newfoundland by Unique Heating in Corner Brook. We are looking forward to the comfort and economics of the system. The system is taking along time to install should be up and running in a day or so. Hi , my name is Denis Arsenault , I don’t have a comment but more of a question , is it normal that the compressor keeps on running 24/7? It’s our first winter with a geothermal and we already had some problems with it , first 3 weeks getting a filter for it because our provider could not order the proper one . Then it got colder outside and the go thermal ran all day and night so we called our provider and thy came to see 2 times and thy sad that the sisttem was wired Wrong at the united and at the thermostat , so it appeared that it was wired Wrong since Aprill of 2016 . Do I need to concern my self with this problem any ferther ? Could you email us at [email protected] and we can help you with your questions? It would be helpful if you included your heat pump’s serial number and model number in the email. With your air to water heat pump, in the summer could I have two active buffer tanks, one hot and one cold, with a 3 way valve to select between the two? Does the unit allow for using O signal to switch back and forth between heating and cooling often? Or it is meant to only be used occasionally depending on the season? Yes, our ATW Series heat pump can switch back and forth between heating and cooling in the manner you suggest, using two tanks would be the ideal way to achieve this. Helⅼo there! I could have sworn I’ve been to this site before but after reading through sߋme of the post I realized it’s new tο me. We are in Clayton, NC 27527. Is it alright to run our unit’s auxiliary backup say at 25 deg F? Or at what min temp?, or simply shut it off untill there is a higher temp, say 35 deg F? The heat pump’s auxiliary set point can be customized via the control board software. You can revise the temperature at which auxiliary heat takes over completely using that software. Does anyone in Minnesota install these ? If there isn’t a Nordic installer near you, we’ll work with any HVAC company that fits our criteria. For more information on that, you can email [email protected]. Just want to make sure I understand. A Mitsubishi mini-split heat pump claims to have Hyper-heat that allows for cold weather operation. I assume this is just a gimmick since the refrigerant, compressor etc are common technologies for all heat pumps. It may have sensors to trigger the defrost cycle efficiently, but that seems to be about all they can change. Do these type of mini-splits have a built in resistance heater for the defrost cycle or do they just not operate the interior fan when the system is cooling inside? I can’t speak with any authority to how the Mitsubishi mini-split works, but I would assume some type of electric assist is used to assist the heat pump in keeping the home warm during those super cold temperatures. The literature is a tad vague on this though. I would also assume that, like our heat pump, that electric resistance heating is triggered during defrost to prevent cold blasts of air on the homeowner. In terms of our heat pump’s lowest operating temperature, it’s currently set at -22C. In truth, we could have set it that cutoff lower, but that would cause undue stress on the heat pump and compromise the 20-year life expectancy of the unit.